UPDATE: I tried this again, using the tomato sauce recipe. Much better! Tonight I made tonkatsu, or breaded fried pork cutlet. It’s the first time I’ve deep-fried anything or used panko (Japanese bread crumbs), so that was exciting. 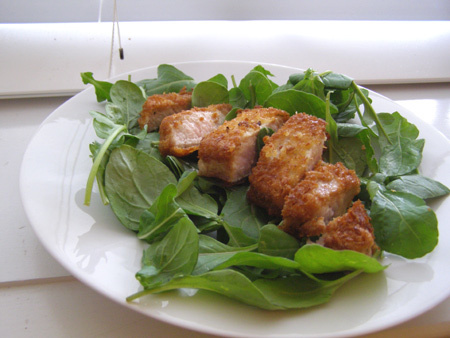 I used this recipe, and substituted arugula for the rice. You could also substitute tofu for the pork to make it vegetarian (use a mix of soft tofu & soy milk instead of the egg). Flatten the pork chops with a meat mallet or cut them in half. These cuts were too thick, and it was impossible to cook both the outside & inside properly. I’ll aim for 1/4 to 3/8-inch thickness next time. 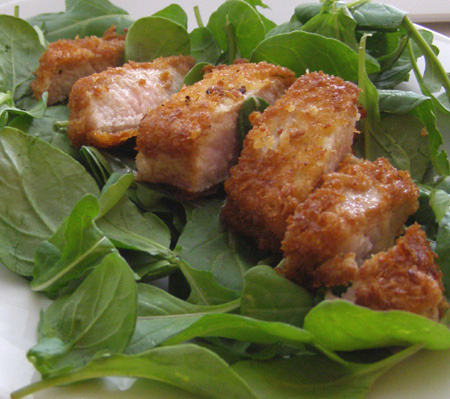 Fry the cutlets in either peanut or sesame oil instead of vegetable. Experiment with the breading seasoning. This recipe only called for salt and pepper; other recipes add chile powder or fresh herbs. Bake instead of fry the meat. Marinate the meat in advance (examples here and here). Top with a good sauce. Tonkatsu sauce is the standard (we tried substituting regular Worcestershire, it didn’t work); I might also try something like this chili-ginger sauce, or even a tomato sauce.